We're home now and I can start processing a few images. Here's what I have so far. For the eclipse, I had two cameras set up; The Sony A7RII with the Rokinon 12mm lens, shooting one image every five minutes which will be composited to show the path of the sun during the eclipse [last photo]. The second camera was the Canon 5D Mark IV with the 600mm + 1.4 teleconverter, all mounted on a guided telescope mount. I would have manually guided the camera but the exposures during totality were calculated to be 1–2 seconds, and I feared at 840mm the sun would be blurred. I framed the Sony using a phone app which calculated the sun's position during the eclipse. The guided mount with the Canon has go-to so it found the sun and followed it nicely. I also had a 7" monitor mounted on the Canon to check focus and framing. Everything went well early on but after a few minutes clouds rolled in and at times the sun was not visible, and I was constantly racking exposure to compensate for cloud cover. Even so, I was thrilled that I was getting mostly good shots. ...and I haven't shot the Sony yet and I'm so discombobulated, I don't know what to do next. I jump back to the Canon to shoot and, oh no the filter! So now the filter is on and I'm shooting the diamond ring and, oh no the filter for the Sony. Whew, I didn't melt anything! The Sony image will need some Photoshopping to make it right though. We are now out of totality and things are proceeding well. Suddenly, the mount has stopped tracking. I futzed with it for a bit but just tracked the rest of the eclipse manually. So that was my eclipse experience. I'm thankful the group was so vocal during totality or I probably would never have looked away from my cameras! Next total eclipse across the US is in seven years from Texas to Vermont; mark your calendars! Big thanks to Dennis. I could just feel the stress and "discombobulation" from his words! —MJ. Geoff Wittig: "Wow! Beautiful photographs of the eclipse. I've screwed up more than a few potentially good wildlife photos by getting discombobulated and fumbling with camera controls I should be able to manage in my sleep. The relentless 'gotta get it right now' pressure of shooting the eclipse is a whole 'nuther level. The only thing I've done that's remotely comparable was photographing a massive controlled blast at a limestone quarry using a pair of tripod mounted D-SLR's. Everything had to be set well in advance for max frame rate JPEG captures, with exposure and focus pre-set, holding down the cable release starting a second before the blast. The whole thing was over in 5 seconds, without the option of asking 'Hey, can you do that again?'" Ed Rosch: "Above is my eclipse picture taken with my Olympus Pen F with a 15mm lens. It’s a composite of two shots taken a few seconds apart and was at the Feather River Winery in North Platte NE." Mike replies: Your shot makes a very interesting contrast to Dennis's pictures. You're recording the experience; he's recording the object/event. Philosophically speaking, I'd say those are different subjects. And offer a clue toward understanding different approaches to the practice of photography. Ed: "You hit the nail square on the head with your comment about my picture. I indeed was attempting to capture the feeling of experiencing the eclipse. I figured that there would be plenty of pictures of the eclipse itself and most of them would be better than anything I’d be able to do. As you point out, very different subjects neither 'superior' to the other. I’d suggest that a viewer engaging with Dennis's images and then looking at mine would have a better vicarious eclipse experience than viewing either alone. "Delving deeper into the differing ways that photographic subjects and photography itself might be approached is hardly a threat but a very useful topic to be explored. Might I assume you’re familiar with the book Photography Changes Everything?" Elton Pinto: "Haha! I love the sense of excitement! That picture of totality is amazing. Thanks for sharing your experience. I also cannot help but think of how photographers sometimes miss experiencing the event in the process of documenting the event." John Masters: "I felt a lesser amount of Dennis's stress on eclipse day. "My health hasn't been great lately and I wasn't even going to attempt photographing the eclipse here in Palm Bay, Florida. We were expecting 84% sun coverage. "I perked up about a week and a half before the eclipse and ordered a sheet of Solar Film, the stuff that knocks down the sun's brightness 100,000 times. After receiving the solar film, I had four days to make some filters for my camera lens and binoculars. I used cardboard, tape, black magic marker, etc., to create filters similar to a bajillion DIY ones on the Internet. "I ended up sitting out in my back yard from 1 p.m. to 4:20 p.m. that day, and got the best shots of the eclipse I could personally do. I used a Fujifilm X-T20 with a Nikon AI lens adapter, a Nikon 300mm ƒ/4.5 lens, a Nikon TC-14 teleconverter, and my semi-homemade filter built into a 72mm to 77mm step up ring. All this on my trusty tripod. My wife and daughters came outside every little while and used the binoculars and the rear screen of my X-T20 to watch the changes and see our peak coverage. "So, without the bazooka lenses many photographers have, my shots aren't going to be in National Geographic. But with careful work in Lightroom and Photoshop, I ended up with this souvenir shot of the whole eclipse as seen from the back yard of chez Masters, Palm Bay, Florida. 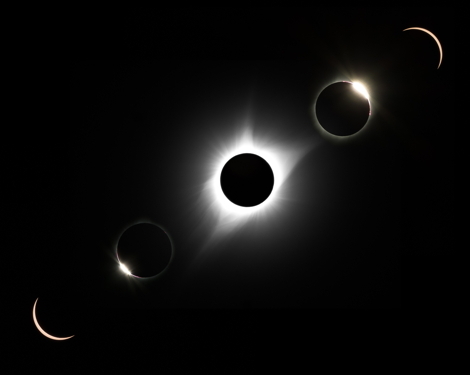 Mike adds: Many TOP readers have sent me accounts of their eclipse experiences or links to their own posts about it or photos of it, including Gary Sutto, Mark Berman, and Gary K. Froehlich, and many others. I'm sorry I can't publish them all! Of course, you need to replace "image.jpg" in that string with the URL of your image. Sorry this isn't easier, but TypePad isn't set up to easily allow images in comments. David: "My wife, my son, and I went to Oregon to see the eclipse. It was to be the first total eclipse any of us had ever seen. On the advice of an acquaintance I just set the camera to make a video recording of us watching it, starting a few minutes before totality. That was the best advice I ever received. The video captures the feelings that the eclipse evoked in us far better than any picture I could ever have produced." Many thanks to Gary for sharing these with us! I took a few snapshots of this one but wanted to make sure I didn't lose track of the live event while fussing with the camera, so I didn't se tup anything fancy. Because of a combination of factors (mostly thin but changing clouds, and a lens without focus stops) I never hit good focus with my 4/3rds body hand held. So I think next time I'll actually try and use a tripod and practice some more with the focus mechanics. Telephoto lenses without infinity stops are annoying. Isn't photography great for the way it accommodates such a variety of interests? Well, after reading that I know what I'll be doing for the Australian eclipse in 2028 - leaving my camera in the bag. it was definitely a good event to have extra gear and fall-back strategies. I was forced to abandon one camera since the sun was not visible in the VF and chasing it with a 400mm lens could take too long. My K-5 and 100-300mm zoom worked very well, and an action-cam video will be prized as well. We'll see how the film camera did next week, an old Ricoh XR-10 with 28-200 zoom for wider location shots and more stars/planets. I find it amazing that our moon is just the right size in just the right orbit to perfectly obscure our Sun every now and then. Second to that in amazingness is the ability to calculate the exact time and path of eclipses both in the past and in the future. Now I know I will be in Austin Texas in April 2024 and not Newfoundland. So basically you didn't experience the eclipse because your were too busy photographing it. Wonderful images, and a great story behind them. I am a bit jealous. I would have loved to be there. There is no way that any of us photogs would have been happy to experience this without taking photographs but sometimes a camera can get in the way of the experience. Dennis clearly had the know how to give us a taste of the moment, right down to the prominences on the limb. Wonderful stuff. I can sympathize with Dennis Huff as ninety-six seconds (totality where I was) is not a lot of time! What a fascinating, on-the-edge-of-your-seat account! The images are excellent, worth all the trouble, especially the composite, which would make a great print sale offering on TOP. Well done, Dennis, and thank you, Mike, for publishing it. The dedication to photography doesn't ruin the experience, it creates a different one, one of directed purpose. Sometimes it is wasted, but when it does work out, it can be very very satisfying. Even for something as rare as a total eclipse. 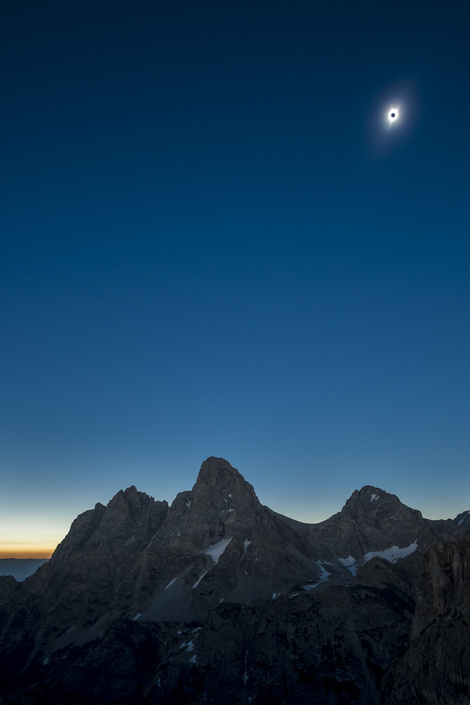 I was particularly inspired by seeing the film 'Eclipse' from Salomon Freeski, in which photographer Reuben Krabbe attempts to get a shot of skiers in front of a 2015 solar eclipse in the arctic. Their ambitions and stress levels were pretty extreme, but it gave me some idea of the sort of planning required for such shots (plus the luck involved). My mini expedition last week played out in a similar way, though with somewhat less complex goals (view totality from a mountain, photograph the moon's shadow as it moves across the distant landscape). 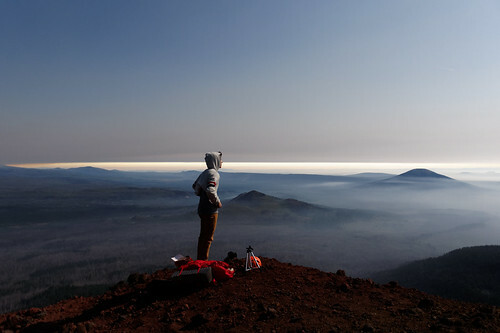 Wildfires made everything uncertain, from what areas and roads would be closed or open, to problems of smoke obscuring visibility (...and where would the crowds be?). But I was still able to arrive on my chosen mountain more than a day early and spent the day before scouting locations. Much of what I had envisioned in Google Earth went out the window as certain realities became apparent on location (smoke was pretty bad, too). But I found a good spot, had a reasonably detailed shot plan, and luck came around. I had a Pentax K5 with 200mm lens on tripod dedicated to the sun, and a Kx with 15mm handheld. I had thought that I wasn't so interested in close-up context-free shots of the sun, since everybody else can get those without being on a mountain, but the appeal of this opportunity was still too great for me! So remote and auto-bracketing made that fairly easy (and the fact that 200mm was not so close to require tracking). Autoexposure would have been fine for the wide angle camera, except that I had it accidentally set to +0.7 compensation (about the opposite of what I wanted). But that wasn't so bad to ruin the shots. My good luck was that winds shifted and kept smoke from being in the worst places, and I also got a surprise extra subject, as one other viewer arrived at my spot at the last minute (almost! 10 minutes before totality), which definitely made for some better shots. A tracking mount would have helped a lot! Not because I was using enough magnification to need it for stable exposures, but because the clouds varied from "blue sky" to "can't tell where the sun was" -- which, with 1000mm-equivalent, made it hard to ever find the sun in the viewfinder on a tripod-mounted camera. (Having to switch back and forth between filter and no filter made it a LOT harder, too.) The totality shot I got was with an emergency switch to hand-held 200mm; with that I was able to find the sun. No filter, the clouds were providing enough filter that with the official solar filter nothing was visible at that moment (changing second by second of course). I watched the total eclipse in my dad's hometown of Johnston City, Illinois. He and my mom are buried there. We had perfectly clear skies directly overhead while Carbondale, Illinois, only 20 miles west was cloudy. The second of these pictures shows the 360-degree sunset during totality. And, then it began. A small nick in the sun from the encroaching moon. Crowds were briefly excited, but quickly became subdued as we waited for totality. It was warm, but slowly cooled as the sun's disk was blocked. The light became soft. Crescent sun shadows were everywhere. Twilight was upon us but the sun was still too bright to watch. The Diamond Ring effect was stunning and the crowds cried out in awe. A few more seconds and TOTALITY. It became dark and we could look at the sun and see a "hole in the sky." It was an emotional moment and I was surprised. I forgot to look around me for the shadow and light in the distance. I forgot to look for the planets in the sky. I forgot to look for the "shadow bands." I did remember to take photos at a variety of exposures but forgot to implement some of the important details. I forgot a lot of things but I'll never forget TOTALITY. It was over too quickly and the Diamand Rings reappeared, followed by a thin crescent. The moment was gone—but the memory will remain. In spite of the mistakes, I still managed to capture a few good images. Chalk that one up to lots of practice. Oops. Here are my eclipse pictures.